At the moment, policy prescriptions like the well-known Taylor rule have traditional target variables only for inflation and the output gap. In his paper, Woodford suggests that a new variable for housing prices be added to the Fed’s policy rule. In a perfectly efficient market, low rates open up home ownership to more people since falling monthly payments make qualification easier. Builders step in to capitalize on the marginal demand that had been pulled forward with lower rates by constructing more homes. At the same time, owners of starter-homes put their houses on the market and move up once they can afford to upgrade thanks to lower mortgage payments. When rates rise, the increased marginal demand from the first time and move-up buyers recedes and we are left with excess inventory which would eventually lead to lower prices. This makes sense in theory and sometimes happens in practice, which is why it’s so commonly thought that interest rates are the primary driver of home values. However, what happens if builders don’t construct very many new units and existing starter-home owners stay put during a period of low rates? 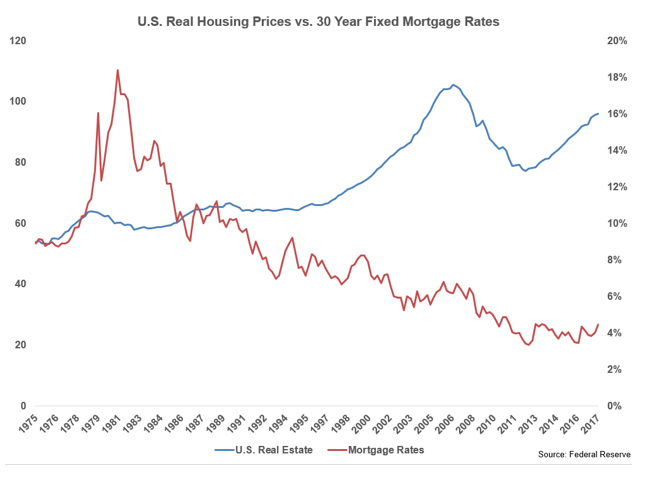 In that case, rising rates do not have much of a negative impact on home prices. In fact, they tend to make owners even less likely to sell (why move if your mortgage rate will be higher) which further dries up already-low supply, potentially pushing prices even higher. If this scenario sounds familiar, that’s because it’s what is happening today, which should be proof-enough that tying Federal Reserve policy to housing price fluctuations is foolish. Influencing the price of housing is relatively straightforward: if lower prices are desired, make it easier and cheaper to build more of it and do the opposite if higher prices are the target outcome. Unfortunately, this is easier said than done in today’s political climate.